Introducing Bible Touchdown - A Bible Knowledge Game for Windows in football game format. Bible Touchdown includes computer teams to play against! Try your luck against 1 of the 6 supplied computer teams. Try beating "Adams Clan". They shouldn't be too hard to beat since they weren't around when the Bible was written. Or, try beating the "Prophets". Be careful, they know their Old Testament pretty well. Bible Touchdown comes with over 1000 questions! Run your offense just like the pros -- select the type of play (short run, long run, short pass, etc.) and then answer a multiple choice question. If you get the question correct, you will gain yards depending on the difficulty of the question. But, if you get the question wrong, WATCH OUT! It could be fumbled or intercepted! 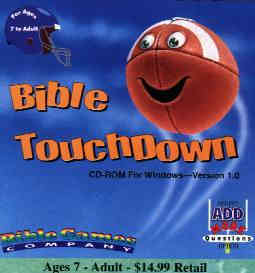 Bible Touchdown is being distributed by Bible Games Company.